WARNING: The following article contains spoilers for Arrow Season 7, Episode 5 titled “The Demon.” Please do not read if you have not seen the episode or read ahead at your own risk. Oliver is in trouble down in Level 2 and looked to a dead person for help in Monday’s episode of Arrow. Confused? Well, let us recap how things went down. Oliver (Stephen Amell) is still down in Level 2 and little does he know, he is in trouble. He is awoken by Talia al Ghul and she is seeking his help. And yes, she’s alive. It turns out she survived the explosion on Lian Yu with help from Ricardo Diaz’s drugs. Now, I sure did not call this one. But we should’ve seen it coming. Talia was the heir to her father’s throne before Oliver killed him. She helped organize and set Oliver up so he’d be thrown down into Level 2. And all because she needs his help to escape. We find out that Talia landed in prison after “running afoul of an old foe in Gotham.” We’ve got our first crossover reference, which means it is getting close. But we assume this foe is Batman, right? It has to be Batman. Another badass team-up in this episode was between Felicity (Emily Bett Rickards) and not-so-evil-but-still-evil Laurel (Katie Cassidy) as they work with Dinah (Juliana Harkavy) to uncover the truth about Dr. Parker’s real plan. He is actually a failed psychologist who is planning to erase all of the inmates’ memories down in the non-existent Level 2. That’s right! Level 2 is not on Slabside’s records. Anyway, Olly agrees to help Talia under the condition she help him expose Dr. Parker for his shady dealings. The pair’s plan works as they are caught and taken to the ‘Blue Room’ to get experimented on. Dr. Parker calls Olly “inmate 4587” only for him to answer “My name is Oliver Queen!” and a badass fight begins. Talia and Olly beatdown on some correctional officers as they make their way to the morgue. There, Talia escapes but not before Oliver gives her the flash drive with all the incriminating evidence about Dr. Parker. Oliver opted to stay because he’d rather not be a fugitive and put his family through that. 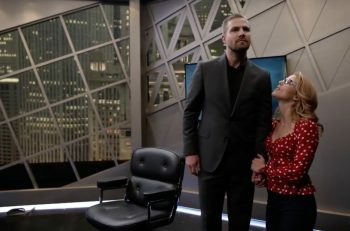 Stan delivers a message from Felicity that she’s close to catching Diaz but Oliver is less than thrilled with this news. The episode ends with a trip to Russia where the Silencer sees Diaz on a rooftop. Who is he assaulting? Well, Russia could only mean one person: Anatoly. And it doesn’t look good for him. The subplot of the episode dealt with Curtis (Echo Kellum) helping ARGUS catch a shady businessman, Dr. Byrd. After some arguing and a talk from John Diggle, Curtis finally goes through with it and they get their man. This plot was really boring and seemed pointless right until the very end. We find out ARGUS has been hiding files from their team members and with Lyla in charge we have to wonder what she is hiding. And why? There were no flashforwards this week, which makes sense. But I am still wondering if Felicity is truly dead in the future or in hiding? I’m guessing the latter for now. What did you make of Arrow on Monday? Let us know in the comments below.